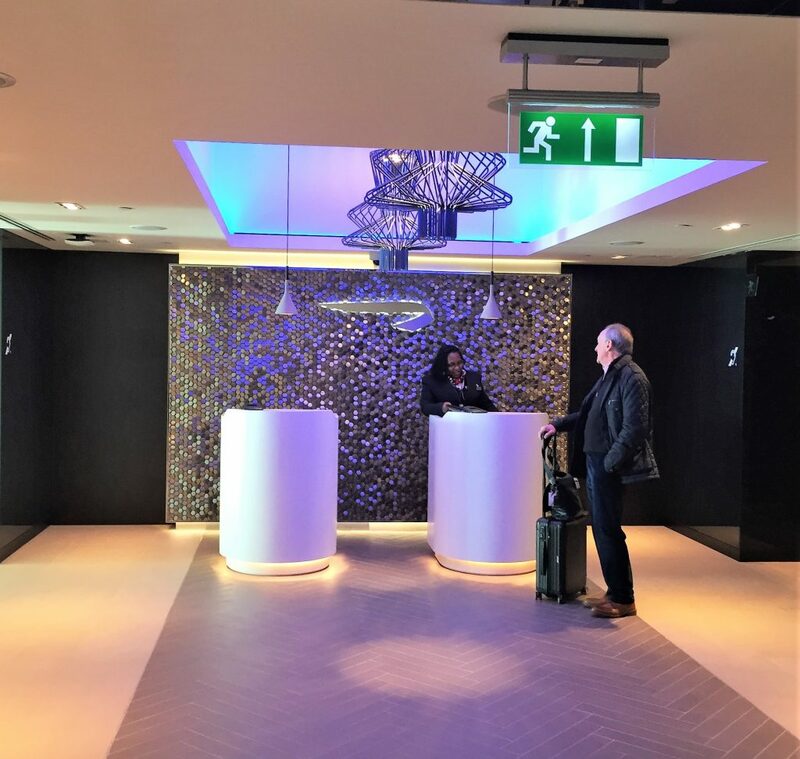 Last week I reviewed BA’s Gatwick South Club lounge and the check-in area. Today I will be looking at what is on offer for First Class and Gold Card Holder/Oneworld Emerald passengers. 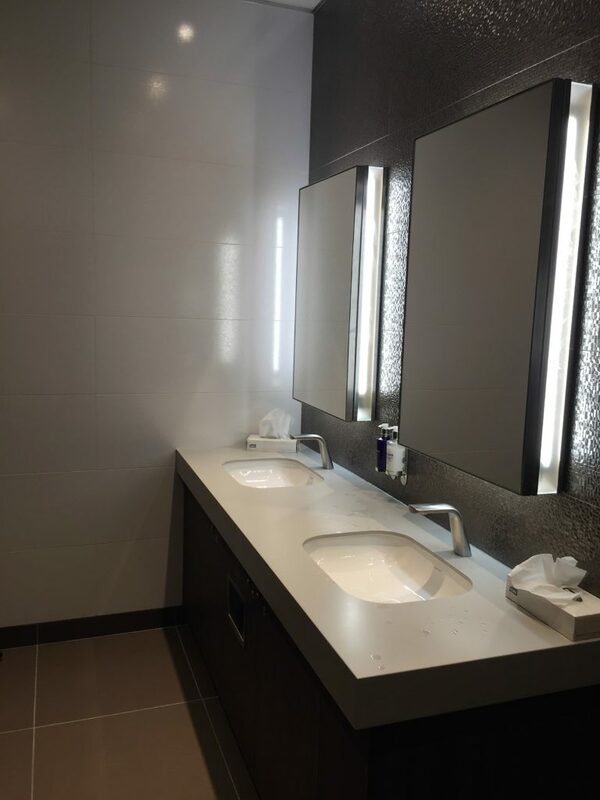 I originally reviewed the lounge a day or so after it opened. 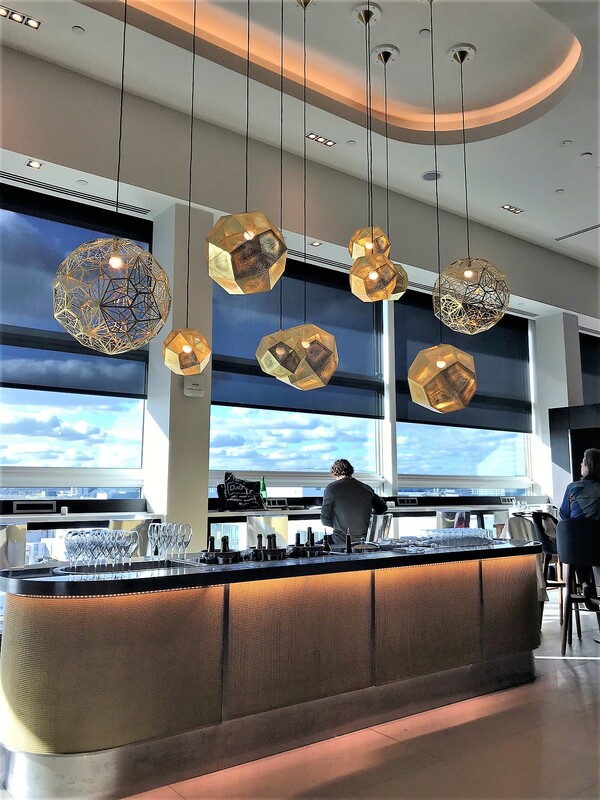 Since then I have visited multiple times so I will be looking at what the lounge is like nearly 18 months after opening and sharing some 360° photos. There is a separate entrance for First and Club passengers but it is not like the First Wing at Heathrow. 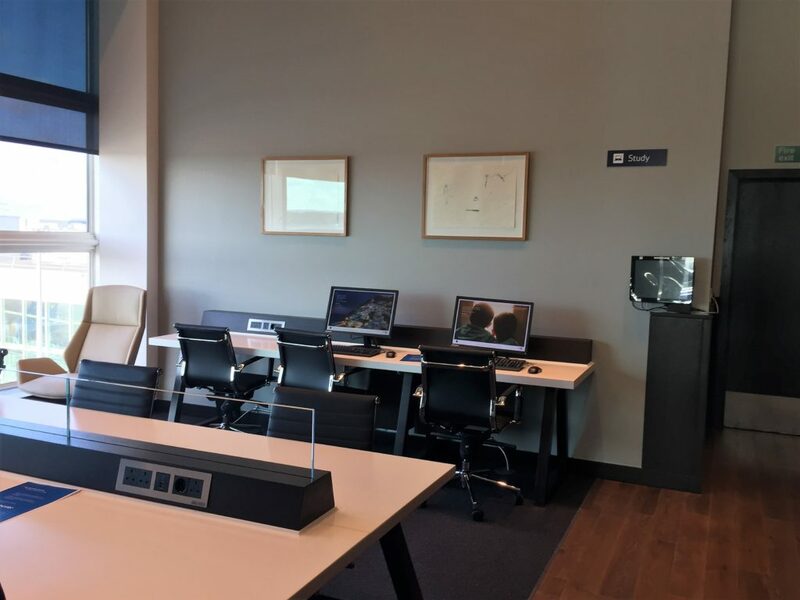 It just leads you to a First desk at the end of the main row of check-in desks. Afterwards, you have to head upstairs to the Premium Security channel to get to the lounge. 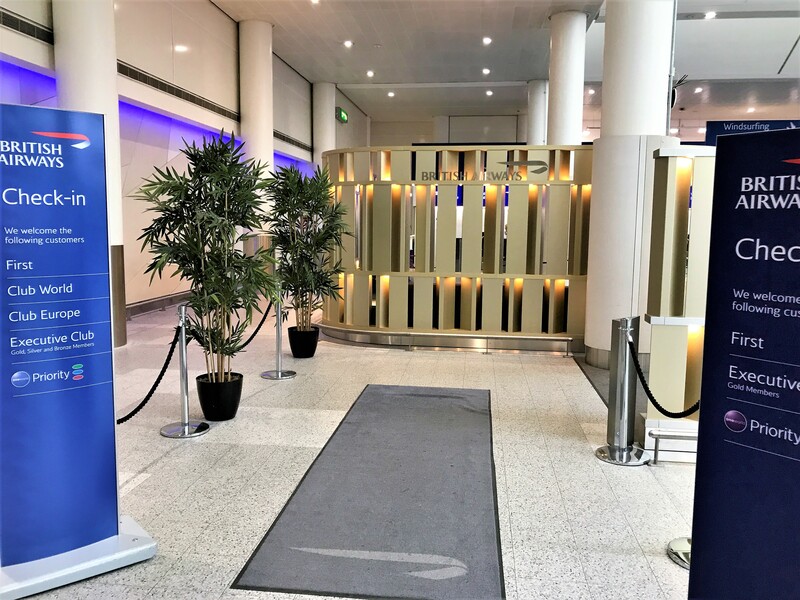 Once through security there is a short cut signposted to the left to the BA and No 1 lounges. From the main departure hall go to the upper level and there is a passageway to the lift by JD Sports. Until 27 October 2018, the summer opening times are 05:15 – 20:00. This was a change from the previous 7am opening which caused a very crowded Club lounge in the morning. It will be interesteing to see what happens over the winter. The BA website still shows the old opening times. Once inside, the area is fairly small but feels light and airy with the floor to ceiling windows. 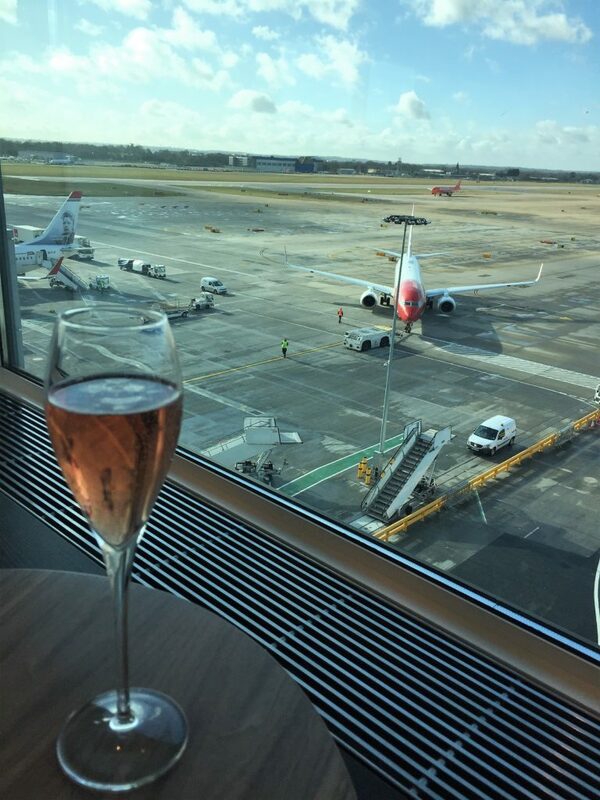 If you are into planes there is a fantastic view of the runway and apron whilst you sip your champagne! 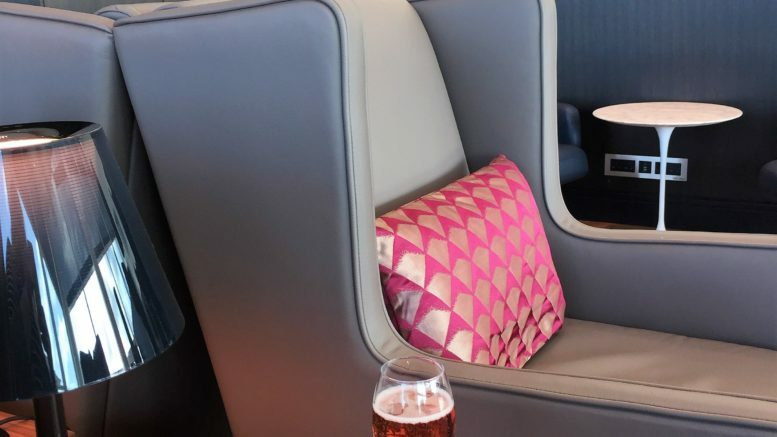 Champagnes and planes – is there a better combination? One of my favourite features were the starburst lights which I thought added a bit of modern elegance. 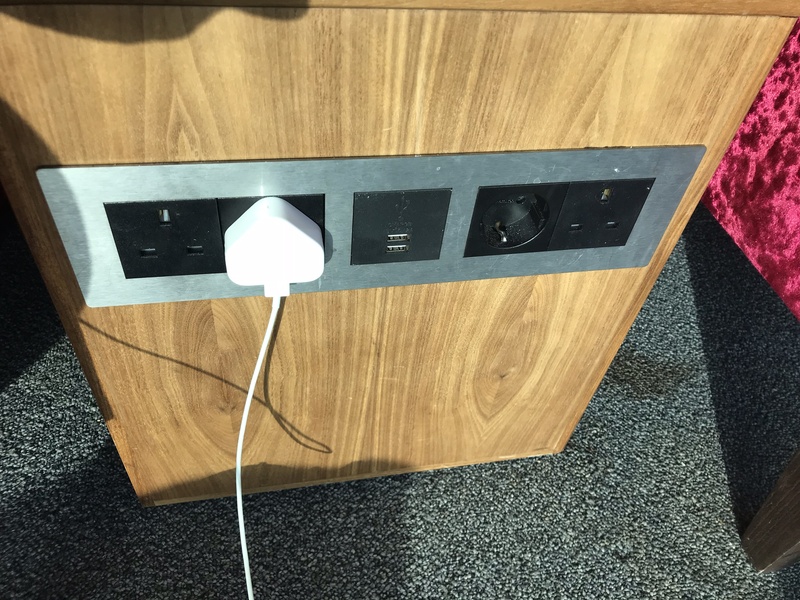 In between the seats are tables with panels of UK and European plug sockets as well as 2 USB ports. The lounge has several different areas. There is the main seating area that has a little nook with armchairs if you want some peace and quiet. The main area leads into the buffet and dining area with some smart dining booths lining the area and the adjacent business centre. 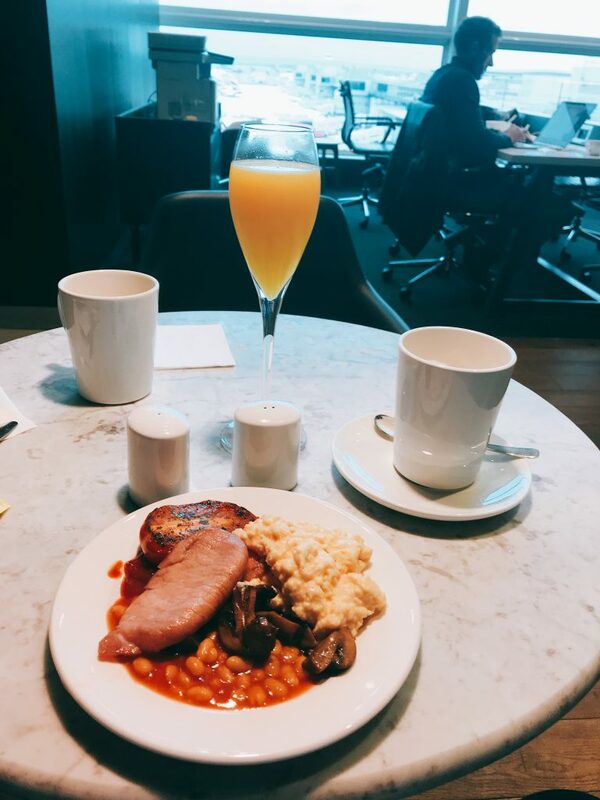 The breakfast selection is pretty extensive and similar to what you would get in the T5 lounge. They have fruit, yoghurt, smoked salmon and cheeses in the cold selection. 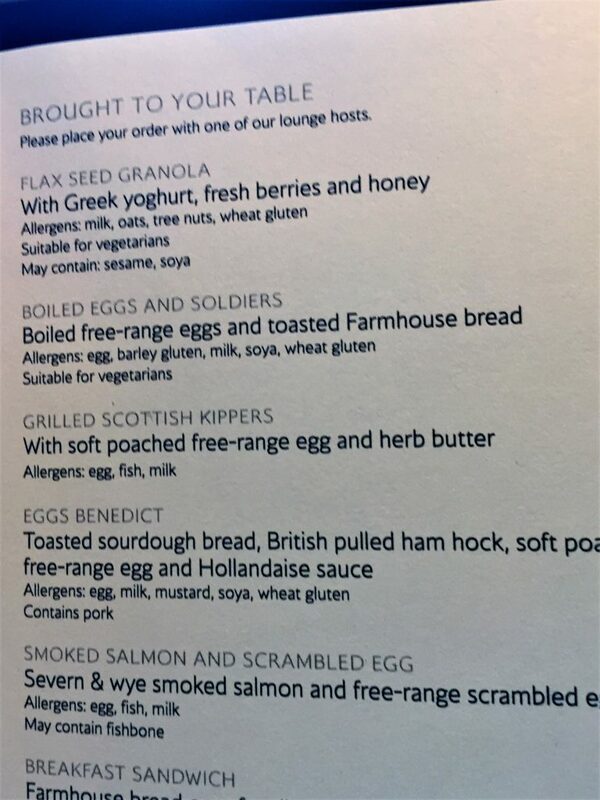 There is also the usual full English in the hot selection as well as porridge. 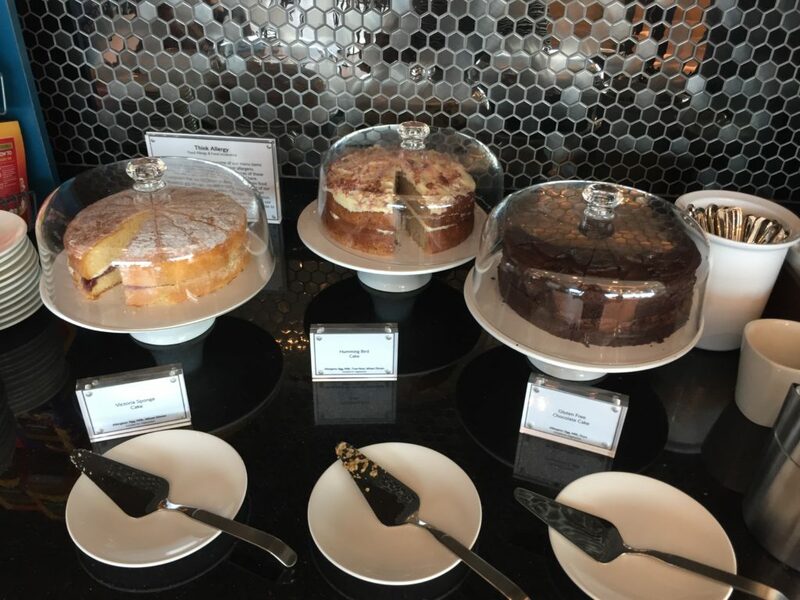 Over by the tea and coffee you could choose from a selection of pastries. 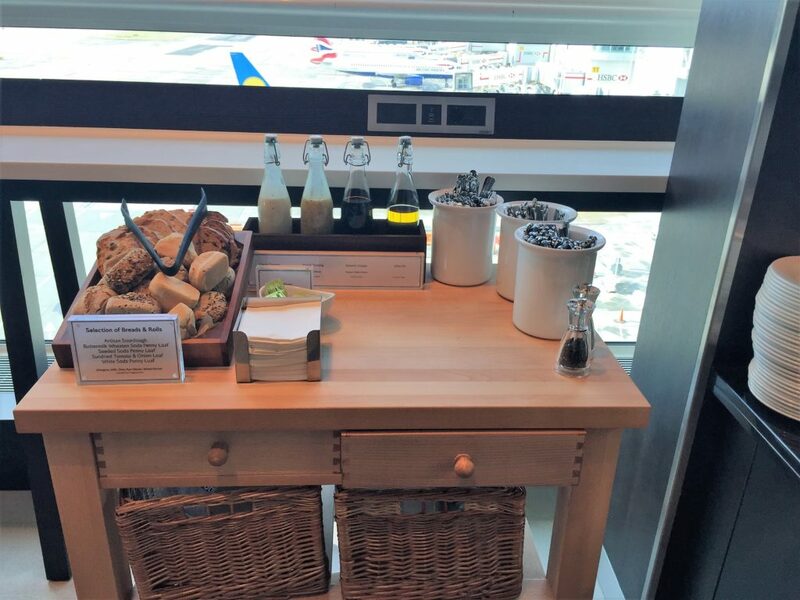 BA now serves Union hand rosted coffee on board and in some lounges including Gatwick. 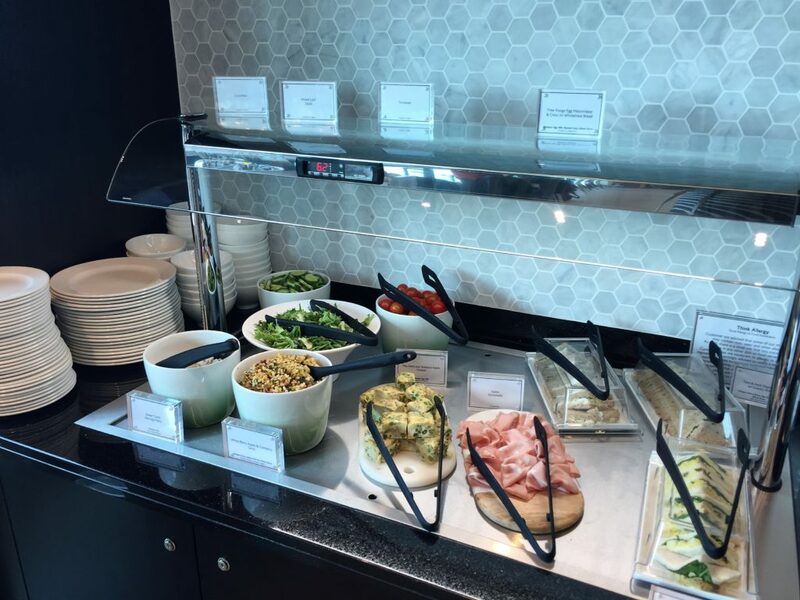 If nothing takes your fancy on the buffet, you can also order food from the menu but only from 7am. Toast is available but you have to order it (that is the only to order item before 7am). They switch to the lunch menu at 12pm and put out a range of salads, sandwiches and a vegetarian frittata. There is also soup and a selection of hot food. 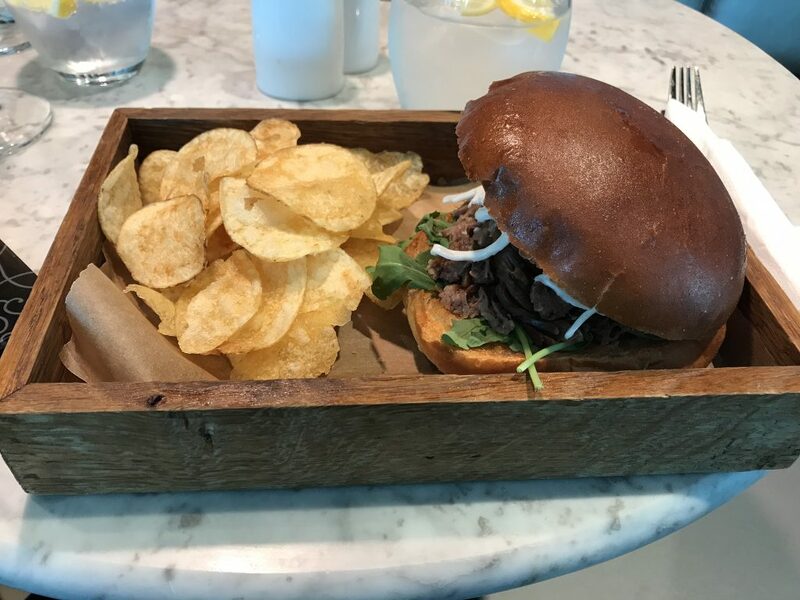 The sandwiches and salads were very similar to Heathrow but slightly less selection as there was no separate tapas section like Heathrow has. 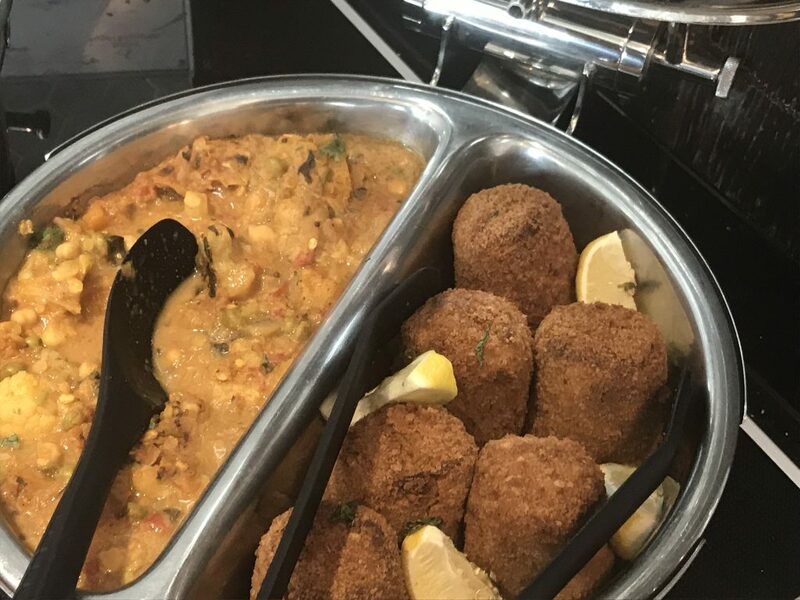 If you don’t fancy any of the buffet food, then there is an order menu which changes regularly although certain staples like the burger are usually on there. 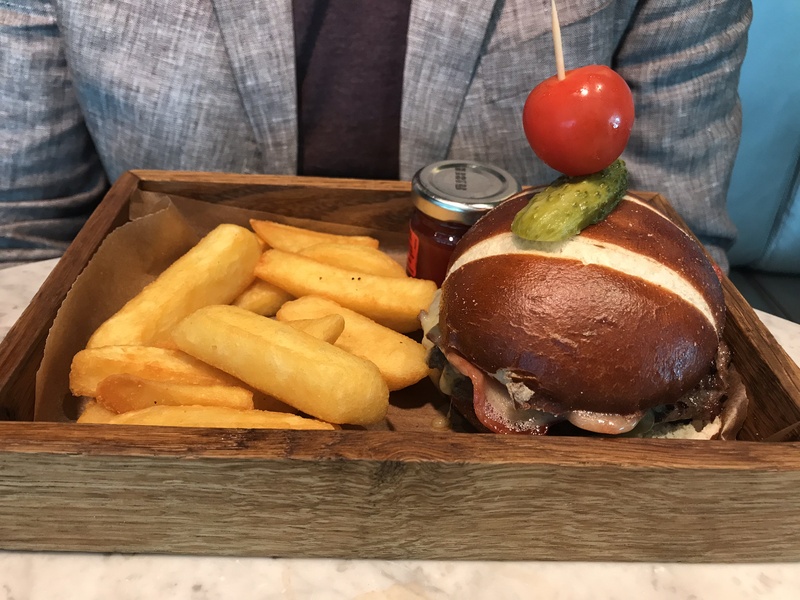 Roving Reporter and I sampled a couple of dishes on the order menu – the burger and the pulled beef. Both were extremely good and better than the Heathrow equivalents. I find the staff in the Gatwick First lounge particularly friendly and helpful compared to Heathrow. Though I have yet to meet Lionel who is something of a star amongst my BA Gold and GGL Facebook group members who meet him in the Gatwick lounge! I did like the rather tempting selection of cakes they put out at lunch time, including a gluten free one. I managed to resist them so can’t report on whether they tasted as good as they looked! The wine selection varies wildly I find with a few gems appearing now again among more pedestrian offerings. There are usually 3 white including a French burgundy, a new world white and one other. 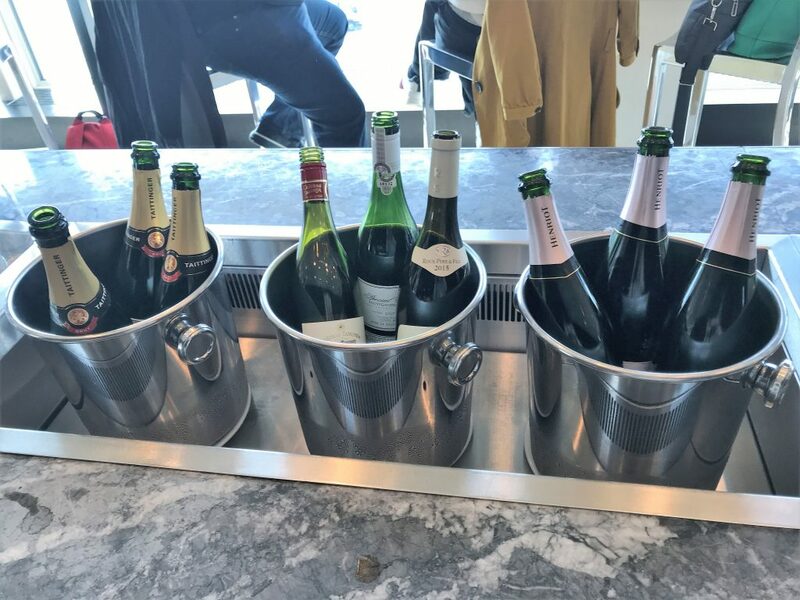 Examples include a Pouilly Fume, Montagny Premier Cru, Springfield Sauvignon Blanc., Creation Sauvignon Blanc, Vouvray and a Simonsig Wooded Chenin Blanc. The champagne is usually Henriot Brut and Rose but due to supply issues it has been varying lately but this was due to be resolved by mid July 2018. 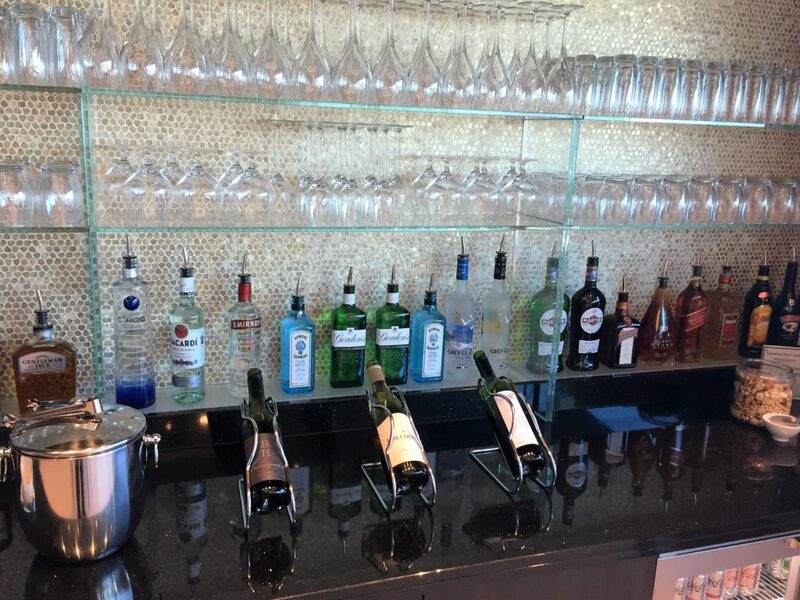 The spirit selection appeared pretty much the same as the Club lounge. There were initially 4 vodka’s including Ciroc which I hadn’t seen in Club, Red label Johnnie Walker, Baron Otard cognac and Gentleman Jack. (EDIT: They have now replaced the JW Red with JW Blue as per Heathrow.) The main difference from the Club lounge is the 2 Champagnes by Henriot, one white and one rose. I enjoy the rose Champagne though I am not so keen on the white one. 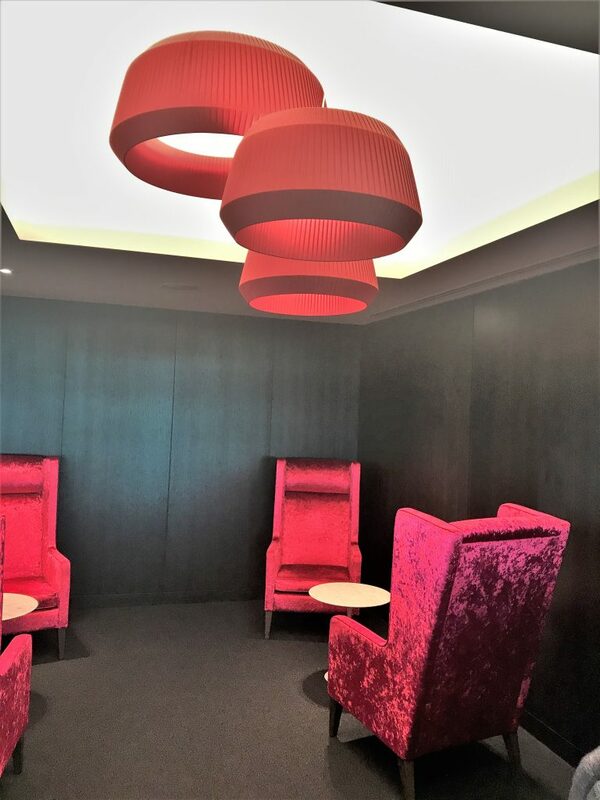 There is a very similar work area to the Club lounge although at least this one has natural daylight. Like the Club lounge it has PCs, a printer and plenty of sockets. 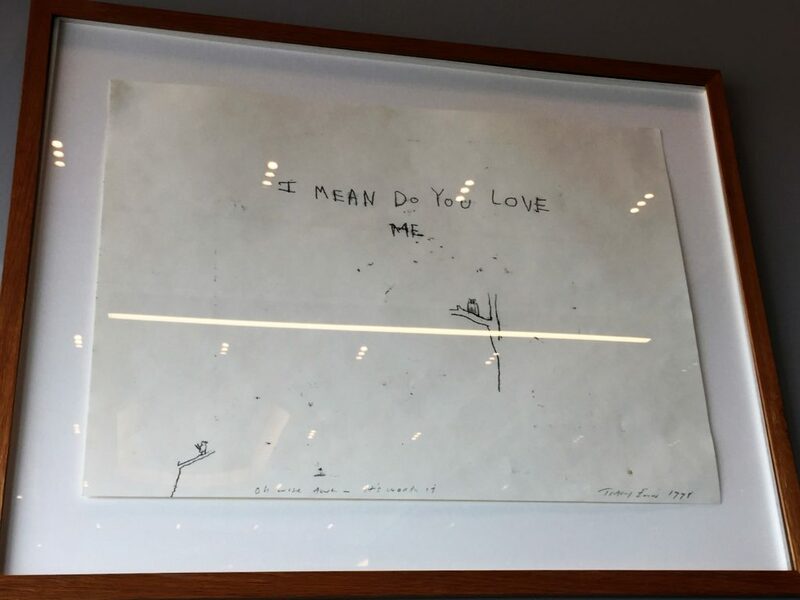 It does have some very strange choices for artwork though that looked a child had drawn them but apparently, they are by Tracey Emin. Shows what I know about art! If you want a shower you have to use the Club ones. 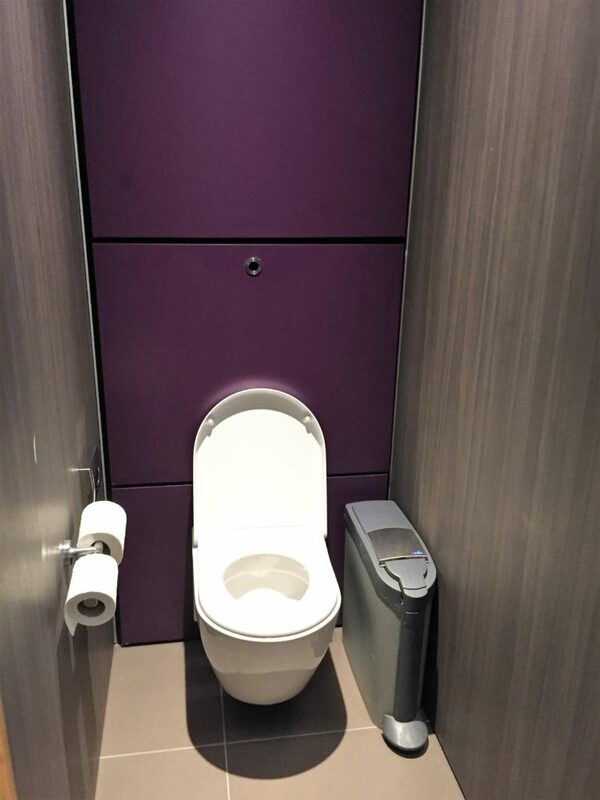 The toilets were fine and certainly better than the Heathrow ones. 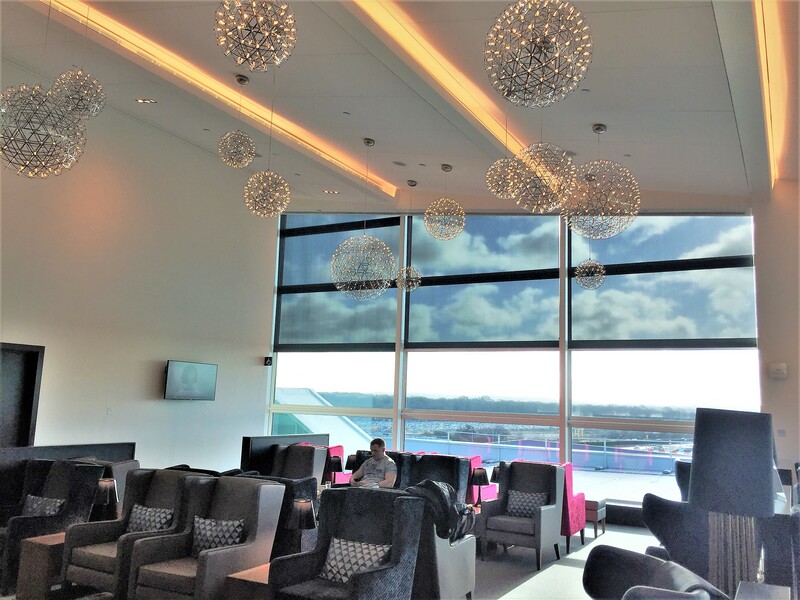 The BA First lounge at Gatwick South is a pleasant space to spend some time and it has a bit of ‘wow’ factor in the decor and views. The order menus deliver some tasty food options, usually with friendly and speedy service. The wine selection is slightly disappointing compared to Heathrow but better than the Club lounge. However, it is definitely an improvement on the old lounge. I much prefer it to the crowded and hot BA Heathrow First lounge. 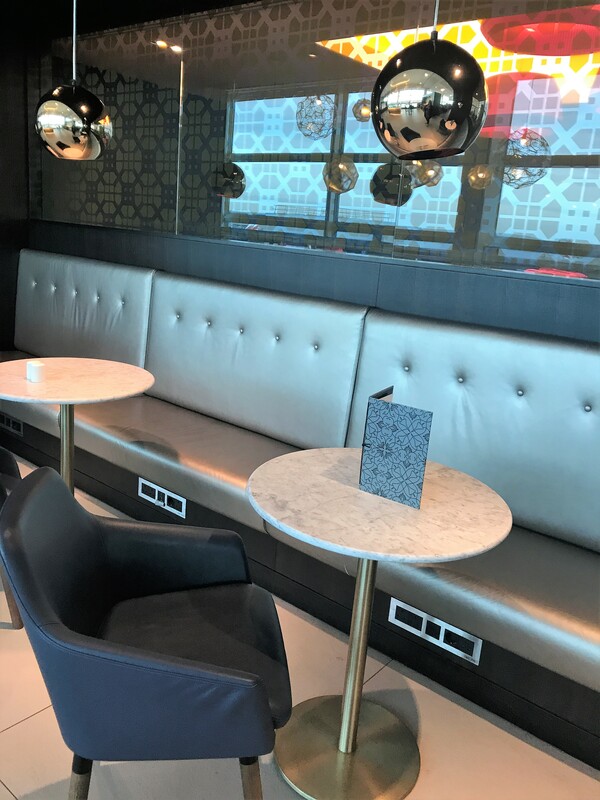 3 Comments on "BA Gatwick South new First lounge review"
Gentleman Jack is made by Jack Daniels in Lynchburg, Tennessee and as such is not a Bourbon. A Bourbon is made from Kentucky Grain……..Jack Daniels do not use Kentucky Grain!!! Shame Club Europe is not treated as First. To be fair im seeing a lot of south galleries business lounge in this first lounge. Coffee machines the same, similar offering at lunch etc.